Lamprochernes nodosus phoretic on a fly. The cephalothorax and pedipalps are yellowish, red-brown, and the opisthosoma olive, green-brown and glossy length of body: 1.8–2.2 mm. Throughout most of Europe. In Britain it is a widely distributed species and is particularly associated with densely populated areas. A synanthropic species, it occurs in compost and dung heaps and also the rotten wood of dead trees. 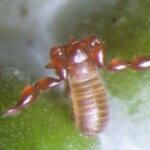 The latter habitat is favoured by L. chyzeri with which L. nodosus can easily be confused, and it is possible that many of the earlier records for L. nodosus are L. chyzeri, so check the knob on the pedipalpal trochanter! 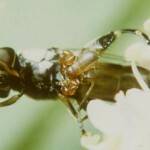 This species, like Pselaphochernes scorpioides, can often be found phoretic on flies. 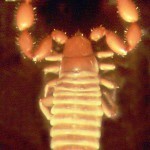 Dry preserved Lamprochernes nodosus; note pedipalpal trochanter. 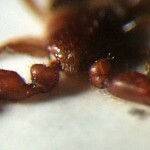 Downward face view of Lamprochernes nodosus showing ‘knob’ of pedipalpal trochanter.